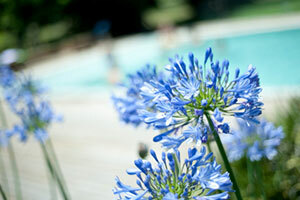 More and more people want a ‘greener’ pool. There is certainly something very healthy and natural about swimming but sadly, most pools aren’t all that environmentally friendly. Your pool will consume a fair amount of electricity for heating, circulation and lighting. The chemicals to treat and balance the water can have an environmental cost and there is the sheer volume of water itself – something that last years hose-pipe ban drew attention to. However, it is possible to retrofit some products to your existing pool that can make it more energy efficient and therefore cheaper to run. It is also possible to reduce the amount of chemicals that are used and the amount of water that needs to go through the pool in a season also by installing retrofit products. Of course, the technology exists to design and build an extremely energy efficient, eco-friendly pool. Such a pool would be heated by renewable energy, use harvested rainwater to fill and top up and be a salt water pool generating its own sanitiser and possibly having a UV purification system. But if you already have a pool, what can you do? Pool covers keep your pool safe and secure as well as helping to cut running costs. Solar covers simply retain heat in the pool and cut down water loss through evaporation. Heat retention covers go that bit further to reduce heat loss. Automatic slatted covers are a ‘push-button’ cover that will retain heat and make your pool safer plus, they can be solar powered. DEL make a wide range of pool covers that can deliver all of the benefits above and they are sure to make a model that is perfect for your pool, either retrofitted to an existing pool or specified for a new build. Their polycarbonate salts – which help absorb the sun’s heat and retain it in your pool come in a range of colours. Many of their automatic covers are available as a solar powered installation. The ecological benefits of a pool cover are that they reduce heat loss and so they reduce the amount of energy that you have to put back into your pool in order to keep the water warm. Pool covers also reduce evaporation and that has a two-fold benefit. The water that is lost by evaporation has to be replaced and water usage has an environmental impact. Also the water that evaporates has been chemically treated so the ‘fresh’ water that replaces it has to be treated in turn and that increases the amount of chemicals that your pool will consume. Pool covers can reduce evaporation by over 90% and reduce chemical usage by 35% – 60%. A MultiCyclone unit works as a pre-filter between the pump and the main filter. It requires no power and has no moving parts but generates a centrifugal current inside the unit that spins out and traps particles before they can reach the sand filter. A MultiCyclone can save you energy as you have to run the pump less and, as the sand filter has to be backwashed much less often, it can also save you as much as 7,000 litres of water a year and cut your chemical bill. If you use a cartridge filter rather than a sand filter these savings will be even greater as the cartridge filter isn’t cleaned by backwashing. Having your pump on a timer will probably mean that you have the pump running for fewer hours and so save energy and money there as well. LED lighting is the most energy efficient lighting option available. An LED system can be digitally controlled to produce an amazing range of mood-lighting effects that will transform the look and atmosphere of your pool at night while using far less energy than conventional pool lighting. LED’s also have a particularly long life so, for underwater fittings, that means that the pool won’t have to be partly drained when a bulb fails with the environmental cost that that incurs. EVA Optic produce a range of LED lighting specifically for the pool environment. Their underwater LED’s are tested to an astonishing 25m depth and their ambient lighting for around your pool room is highly resistant to heat, moisture and chlorine. EVA Optic LED systems can be DMX controlled to produce a coloured lighting effect which can be changed to suit any mood. As an alternative, the Spectravision range of lights transform any pool into a night time oasis of glowing colourful warmth by combining the vibrancy and brilliance of LED with the soothing effects of colour. The Spectravision lights also can give an ultra white light. Incredibly eco-friendly, once installed a solar heating system for your pool has little or no running costs. The panels have a long life expectancy and a system should payback the installation costs in somewhere between 2 and 5 years. A solar heating system really comes into it’s own in the UK when it is used in conjunction with a traditional heating system, topping up your pool’s heat just at the time you are most likely to want to use your pool. A heat pump is one of the most efficient options available for heating your pool water. Heat pumps actually multiply the amount of heat that can be produced from each kWh of electricity by drawing warmth from the air to put into your pool. DURA and DURA+ heat pumps benefit from oversized, titanium heat exchangers making them highly resistant to corrosion by salt, chlorine and bromine. Both models are suited to UK climate with the DURA+ able to provide all year heating capability and show a significant saving on energy bills. All of these eco-friendly technologies can be installed in your existing pool and they all have the advantage of not only making your pool more eco-friendly but also saving you money on running costs. The UV options now available from leading water treatment specialist Triogen include cost-effective TR2 units which save on both capital and running costs while improving water quality. The Triogen UV system when used in tandem with existing sanitising treatments, such as salt water chlorination or standard dosing will mean a substantial reduction in the chemical levels needed. For owners, this means a better pool or spa experience in addition to reduced running costs and a more environmentally friendly pool. There are many more articles on this site that will give you information on almost every aspect of your pool and if you would like help in finding a pool business who could supply and install any of the products listed above, just use the contact button at the top right of this article. If you would like to add a comment to this article then please use the reply box below and get the conversation started.